Japan has been engaged in a ballistic missile defense dialogue with the United States since 1987 when the two countries signed an Agreement Concerning Japanese Participation in Research for the Strategic Defense Initiative. Since 1987, BMDO sponsored two joint industry studies, which recommended a two-tiered TMD architecture. In December 1993, a U.S.-Japan TMD Working Group (TMD WG) was created under the Security Sub Committee, Security Consultative Committee (SSC-SCC) to provide a forum for regular discussion of TMD and TMD-related matters such as regional political implications and treaty compliance. In October 1994, a Government of Japanled U.S.-Japan Bilateral Study on Ballistic Missile Defense was initiated; the study provided extensive simulation and systems analysis to identify and evaluate various missile defense alternative architectures. 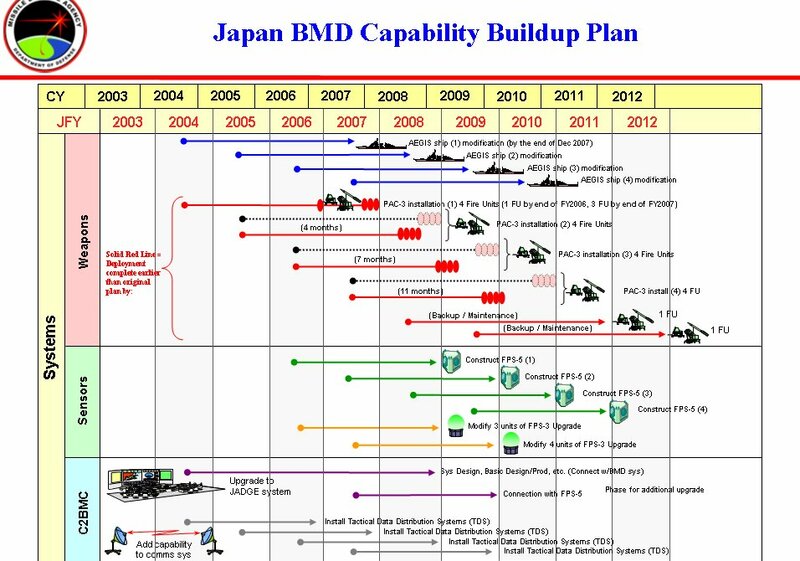 The results identified and evaluated specific Japanese TMD-related technologies associated with the U.S. Navy Theater Wide TBMD program and their related capabilities that would enhance U.S. TMD systems development. Geography is the predominant factor to be considered in designing the architecture requirements and options for defense of Japan. There is a sea barrier of about 1,000 km between most of Japan and North Korea. To traverse this distance, a TBM launched against Japan must travel a substantial part of the way exo-atmospherically. The extended period of flight that the North Korean TBMs spend in the exo-atmosphere provides upper tier TBMD systems ample engagement opportunities (shoot-look-shoot coverage in many defended areas) and deployment flexibility (ships can be positioned for either ascent, midcourse or descent phase defense). The 2000 "Report to Congress on Theater Missile Defense Architecture Options for the Asia-Pacific Region" concluded "For a NTW Block I-like system, four ship positions would provide nearly complete coverage of Japan with substantial shoot-look-shoot opportunities over much of Japanese territory. With the faster missile and better kill vehicle typical of the NTW Block II-like system, which would allow expansion of the engagement volume, an even more efficient deployment would be possible. One ship position is sufficient to provide full national coverage. The interceptor speed would allow this system to provide a shoot-look-shoot engagements over the central portion of the country." The Department of Defense signed a Memorandum of Agreement with the Japan Defense Agency in 1999 to conduct cooperative research to enhance the capabilities of the Standard Missile-3. The focus of research was on four components: sensor, advanced kinetic warhead, second stage propulsion, and lightweight nosecone. Separating nose cone development. The final test of the JCR clamshell nosecone was conducted on March 8, 2006. The nosecone was integrated into an SM-3 missile which was launched against a simulated target. The test successfully demonstrated thermal and separation performance of the nosecone. Two-color seeker development. Calibration, mechanical integration tests, complex scene tests and joint risk reduction tests have been conducted. The remaining task is joint captive carry testing. Solid Divert and Attitude Control System development. A joint DACS study is continuing to determine hardware components for potential cooperative DACS development. Japan is conducting testing of components that could demonstrate potential use in future cooperative DACS designs. These tests began in May 2006 and continued through September. 21 inch second stage rocket motor development. In Japan, all prototype second stage rocket motor tests have been successful with a Japanese Defense Agency (JDA) developed rocket motor. Additional insensitive munitions and environmental testing is in progress. 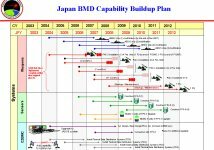 In December 2003, through a formal Cabinet Decision, the Government of Japan became the first ally to decide to proceed with the acquisition of a multi-layered BMD system, basing its initial capability on upgrades of its Aegis Destroyers and acquisition of the SM-3 missile. The two nations began the research program in 1999 for a system to launch interceptors from Aegis destroyers. Japan has spent 15.6 billion yen up to fiscal 2003. The AEGIS Weapon System and Standard missiles will be used on JMSDF ships and will provide, in concert with JSDF PAC-3 Patriot missiles, the initial ballistic missile defense for mainland Japan. Japan already has the upgraded AEGIS Weapon System and SM-3 Block IA Standard missiles in its inventory and will have no difficulty absorbing the additional upgraded Weapon System and missiles. On 5 May 2004, the Defense Security Cooperation Agency notified Congress of a possible Foreign Military Sale to Japan of SM-3 Block 1A Standard Missiles as well as associated equipment and services. The total value, if all options are exercised, could be as high as $725 million. 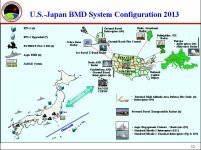 The Government of Japan has requested a possible sale of nine SM-3 Block 1A Standard missiles with MK 21 Mod 2 canisters, Ballistic Missile Defense (BMD) upgrades to one AEGIS Weapon System, AEGIS BMD Vertical Launch System ORDALTs, containers, spare and repair parts, supply support, U.S. Government and contractor technical assistance and other related elements of logistics support. Japan will use the Standard missiles to update older or less reliable missiles currently in the Japan Maritime Self Defense Force (JMSDF) fleet. The AEGIS Weapon System and Standard missiles will be used on JMSDF ships. The purchaser, who already has missiles in its inventory, will have no difficulty absorbing these additional missiles. On 29 June 2005, the Defense Security Cooperation Agency notified Congress of a possible Foreign Military Sale to Japan of nine SM-3 Block IA Standard missiles with MK 21 Mod 2 canisters, as well as associated equipment and services. The total value, if all options are exercised, could be as high as $387 million. 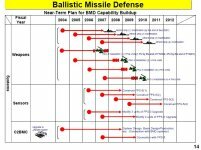 The Government of Japan has requested a possible sale of nine SM-3 Block IA Standard missiles with MK 21 Mod 2 canisters, Ballistic Missile Defense (BMD) upgrades to one AEGIS Weapon System, AEGIS BMD Vertical Launch System ORDALTs, containers, spare and repair parts, publications, documentation, supply support, U.S. Government and contractor technical assistance and other related elements of logistics support. The estimated cost is $387 million. Under SDF-Law, there is a rigid procedure to officially respond to BMs coming to Japan. The procedure may need so much time that Japan cannot intercept the coming BMs, timely. Therefore, there was a need to submit a necessary amendment bill for more speedy decision to shoot against BMs. Diet revised SDF Law in July 2005 allows the Defense Minister to "respond to incoming missiles or other objects" without prior approval of the PM or Diet in an "emergency case." The JCR Project completed in March 2007. The follow-on joint SM-3 upgrade project, SM-3 Cooperative Development Project, builds upon the JCR efforts. A Memorandum of Understanding (MOU) to begin the cooperative development of the SM-3 Block IIA missile has been signed. Building upon the research of the JCR Project components, the SCD Project will focus on joint design, development and test of a 21 inch diameter variant of the SM-3 missile. This is the largest cooperative development project undertaken by the U.S. Department of Defense. 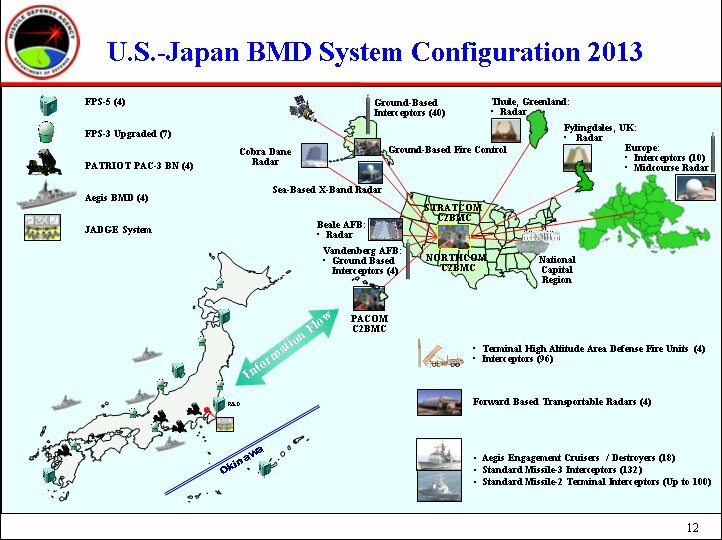 The first Aegis BMD installation in the Japan Maritime Self Defense Force was scheduled for the fall of 2007. In addition, Japan will upgrade their Patriot units with PAC-3 missiles and improved ground support equipment. The US has worked closely with Japan since 1999 to design and develop advanced components for the SM-3 missile. This project would culminate in flight tests of SM-3 variant missiles in 2005 and 2006. The US worked with Japan to test the engagement performance of the SM-3 nosecone developed in the U.S./Japan Cooperative Research project. The Japan Cooperative project flight tested a jointly-developed component (lightweight nosecone) on a Standard Missile-3 on on 18 December 2007 (Joint Control Test Vehicle (JCTV)- 1 and Joint Flight Mission (JFM)- 1). 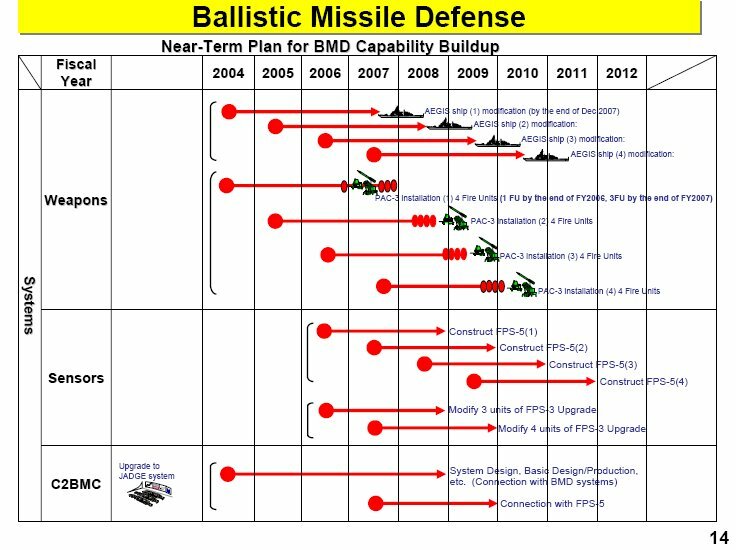 To assure midcourse segment BMDS meet the capability specifications across the full range of midcourse engagements, the program will conduct a structured concept definition effort leading to re-allocation of system capabilities among ground-based and sea-based products to achieve the best integrated segment performance at the lowest overall cost. On 29 January 2019 the US State Department has made a determination approving a possible Foreign Military Sale to Japan of two (2) AEGIS Weapon Systems (AWS), two (2) Multi-Mission Signal Processors (MMSP) and two (2) Command and Control Processor (C2P) Refreshes and related equipment for an estimated cost of $2.150 billion. The Government of Japan has requested to buy two (2) AEGIS Weapon Systems (AWS), two (2) Multi-Mission Signal Processors (MMSP) and two (2) Command and Control Processor (C2P) Refreshes. Also included is radio navigation equipment, naval ordnance, two (2) Identification Friend or Foe (IFF) Systems, Global Command and Control System-Maritime (GCCS-M) hardware, and two (2) Inertial Navigation Systems (INS), U.S. Government and contractor representatives’ technical, engineering and logistics support services, installation support material, training, construction services for six (6) vertical launch system launcher module enclosures, communications equipment and associated spares, classified and unclassified publications and software, and other related elements of logistical and program support. The total estimated program cost is $2.150 billion. This proposed sale will contribute to the foreign policy and national security of the United States by improving the security of a major ally that is a force for political stability and economic progress in the Asia-Pacific region. It is vital to U.S. national interests to assist Japan in developing and maintaining a strong and effective self-defense capability. This proposed sale will provide the Government of Japan with an enhanced capability against increasingly sophisticated ballistic missile threats and create an expanded, layered defense of its homeland. Japan, which already has the AEGIS in its inventory, will have no difficulty absorbing this system into its armed forces.